The Cathedral was founded in 1096, consecrated in 1101 and completed in 1145. 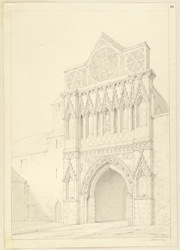 Ethelbert Gate marks the entrance to the Cathedral's close and was built in 1316 on the site of Ethelbert's Chapel which was burned down in 1272 by the town's residents. At that time, religious communities fell outside of normal civil jurisdiction and thus enjoyed rights and privileges which often led to conflict with local people. The Cathedral authorities tried to claim lucrative rights over the weekly market held in the town. The civic population fell into bitter disagreement with the churchmen. Servants from the Priory were sent on a rampage through the town, killing one citizen as they went. The local people retaliated by storming the close and razing to the ground the small church that stood there.